A dog has died in freezing water, after falling through the ice on a frozen pond in Derbyshire. It’s sparked a warning to dog owners to keep their pets on a lead at all times around water. 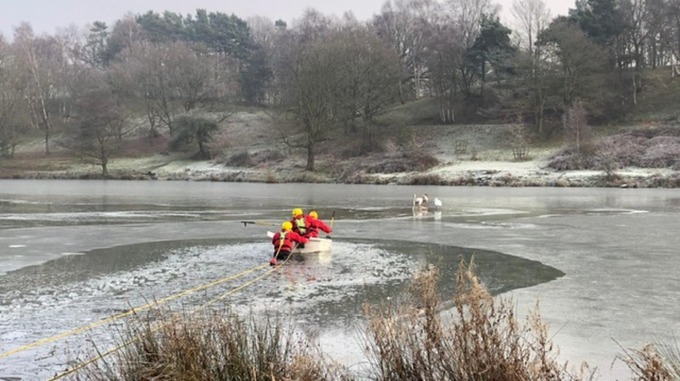 Firefighters were called to Hardwick Hall Park to rescue a small dog that had fallen through the ice. They used a small boat to get to the dog that had run onto the ice and fallen through – the dog died as a result of the freezing cold water. 12:23 #Chesterfield_Green & water rescue units from #Kingsway_Green & #Highfields from @nottsfire attended Hardwick Hall Park, using a ranger’s boat to rescue a small dog. Sadly the dog was deceased. In this weather please keep your dogs on leashes when near water. #WaterSafety. Why do people never learn. Every year we are all warned. So why don’t people keep does on lead when ponds are frozen.